There's a legend 'round here. A killer buried, but not dead. A curse on Crystal Lake. A death curse. Jason Voorhees's curse. They say he died as a boy, but he keeps coming back. Few have seen him and lived. Some have even tried to stop him. No one can. People forget he's down there... waiting. 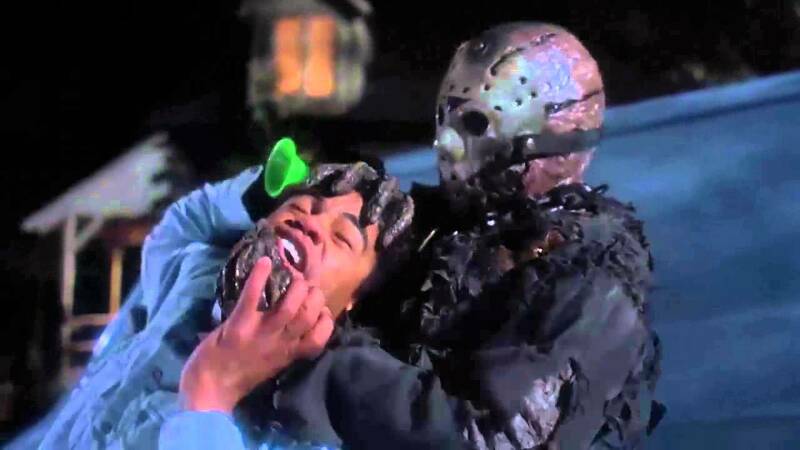 Ahh... Another Friday the 13th! Lucky for me SyFy Channel is doing a marathon so I was able to squeeze this in. This was the only Friday movie that I hadn't seen. What an amazing intro that really gets the blood pumping. This is something that Jason can do that Freddy can't. This movie starts out as horror movie gold. They nickname this one "Carrie vs. Jason" Yeah, I can see that. I found myself getting really into the psychic side of the movie. It reminded me a lot of Dr.Channard and Tiffany from Hellraiser 2. You could really tell that they were grasping for ideas here. None the less its an entertaining film. It features a really jacked Kane Hodder as a all out brutal, killer, zombie Jason! I know. What a way to make your mark as the most brutal Jason killer ever. His make-up is really cool looking too. Well aside from the end of the movie. The killings are brutal and original as always. You can always count on that. Some of them are pretty hilarious. I'm lookin' at you sleeping-bag scene. The effects were really decent. What else would I expect from this series. Effects have never been their low point. The eighties is running rampant through the style in the movie. The pant-suits! Oh the pant-suits! The colors, the hair... jeez... It is quite a testament to it's time. No matter how many of these cookie cutter horror flicks were released. The movie follows the exact same formula as before. Dickhead young adults disrespecting Crystal Lake by partying and screwing. Jason has to come in and clean house. Pretty standard. I do appreciate the added Psychic element though. When in doubt just throw in a broad with psychic powers. Didn't Nightmare on Elm Street do the exact same thing? It adds a completely different element for Jason to face. This is a great Friday movie to watch in a group setting. Friends laughing at it calling out jokes. The killings are extra brutal, that accounts for a ton of the entertainment here. Go ahead and watch this one with your friends. It's worth it. You won't be disappointed and you get a nice payoff at the end. Several explicit scenes of gore were cut in order to avoid an X rating, including: Maddy's death, who originally had a sickle jammed through her neck; Ben's death, which showed Jason crushing his head into a bloody pulp; Kate's death, which showed Jason ramming her in the eye with a party horn; the VHS and DVD versions only show a full view of Jason as he aims towards her face, but quickly cuts to another scene before revealing the blood and gore gushing from her eye; we see Eddie's head hit the floor; a shot of Russell's face splitting open with a large blood spurt; Dan's original death had Jason ripping out his guts; Amanda Shepard's death originally showed Jason stabbing her from behind, with the resulting blade going through her chest and subsequent blood hitting Dr. Crews; Dr. Crews's death showed Jason's tree-trimming saw violently cutting into his stomach, sending a fountain of blood and guts in the air; Melissa's original death had Jason cleaving her head in half with an axe with a close-up of her eyes still wriggling in their sockets. Mostly filmed in Alabama. However, some key scenes were filmed in California. The house that Robin is killed in is in Kelly Gulch in Topanga Canyon, CA. This was originally slated to be a Freddy vs. Jason movie bu the rights fell through.